Second to our homes, our vehicles can be one of our largest financial investments. If you own an Audi, BMW, BMW Mini or Mercedes, then it won’t lose its value within a short time unless it has had the unfortunate circumstance of being in an accident. However to certify that our vehicles hold their maximum value, so that they may be sold on for a worthwhile price when the time comes to change them, can be a valuable asset to your bank balance. First impressions and aesthetics are so important for vehicles, especially as this is the first thing that buyers see. There is no point having a vehicle that is mechanically tip top if the bodywork and interior isn’t well maintained. Vehicle owners should maintain interior to a good standard by regularly cleaning and removing stains on fabrics and interior surfaces, as soon as they occur. Don’t smoke in your car! Not only is it difficult to get rid of the smell of smoke but smoking can also dis-colour paintwork and fabrics. Scratches and dinks can occur in the most un-predictable of situations. Regularly checking over the bodywork and T-cutting any minor scratches will ensure that the styling is kept pristine. 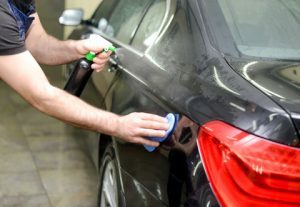 Waxing the vehicle a few times a year will also protect the depth of colour in the paintwork and its surface. When and where possible, keep the vehicle in a carport or store in a garage to protect its exterior from weathering. For those owners of BMW and BMW Mini vehicles, investing in AC Schnitzer upgrades will not only set the vehicle apart from others in terms of the motorsport look, but could also help to boost its overall resale value. Speak to our AC Schnitzer team if you would like to find out more about the types of interior and exterior styling that we can offer. In terms of the mechanics of a vehicle there are some important aspects, which given some due care and attention will go a long way in preserving its overall value. Vehicles are normally road tested before a buyer makes a purchase decision, so safeguarding that there are no strange sounds and that the vehicle drives well will encourage them to make their decision. By booking your vehicle into Stourbridge Automotive Ltd for regular services and an engine oil change will ensure that the engine runs to its best capability, whilst investing in an engine tune with our BHP UK and AC Schnitzer tuning services here at Stourbridge Automotive Ltd, will also help to improve the vehicle’s performance and fuel consumption. Hard acceleration and braking often encourages rapid and poor wear and tear. By driving slower it can prevent this as gentler movements have less impact on the mechanics. This will help to maintain their quality and offer the added cost saving benefit to the driver in using less fuel! Finally, cars with a lower mileage have a head start in ‘sale popularity’ than those that don’t. More miles on the clock equals less value. Finding an alternative to reduce the miles, such as walking or car sharing on the odd trip here and there will reduce the level on those small mileage increments from increasing. For more information on looking after your Audi, BMW, BMW Mini or Mercedes, please contact our team at Stourbridge Automotive Ltd. We provide a range of mechanical and repair services for Audi, BMW, BMW Mini and Mercedes, including Vehicle Servicing, AC Schnitzer Vehicle Upgrades, BHP UK Tuning and Used Car Inspections on recent purchases.